6 Group was born out of the British Commonwealth Air Training Plan (BCATP), which, among other things called for the formation of 25 Canadian Squadrons in Britain. This figure was later downsized. The Canadian vision was of a Canadian force operating independently alongside Bomber Command in the manner of the American 8th, but skilful negotiating by the British resulted in Canadian Bomber squadron… s operating within the RAF under RAF control but funded by Canada. On the 1st of January 1943 most of the existing RCAF squadrons were brought together on stations in North Yorkshire and County Durham to form 6 Group. By the end of the war 14 Squadrons were operational and one other had been posted to the Pathfinders. 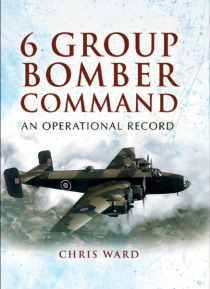 After an uncertain beginning the Group became an efficient and valuable contributor to Bomber Command's campaigns. Beginning predominantly with Wellingtons the Group was re-equipped with a mixture of Halifaxes and Lancasters, including the Hercules powered MkII and the Canadian built MKX.